When building systems using the request/response pattern, the Reply method exposed by the IMessageHandlerContext or IBus interface is used to reply to the sender of the incoming message. The same Reply method can be used inside a Saga and it is important to understand that it can have a different semantic, otherwise it can lead to unexpected behavior. The Reply method always delivers the message to the sender address of the incoming message. 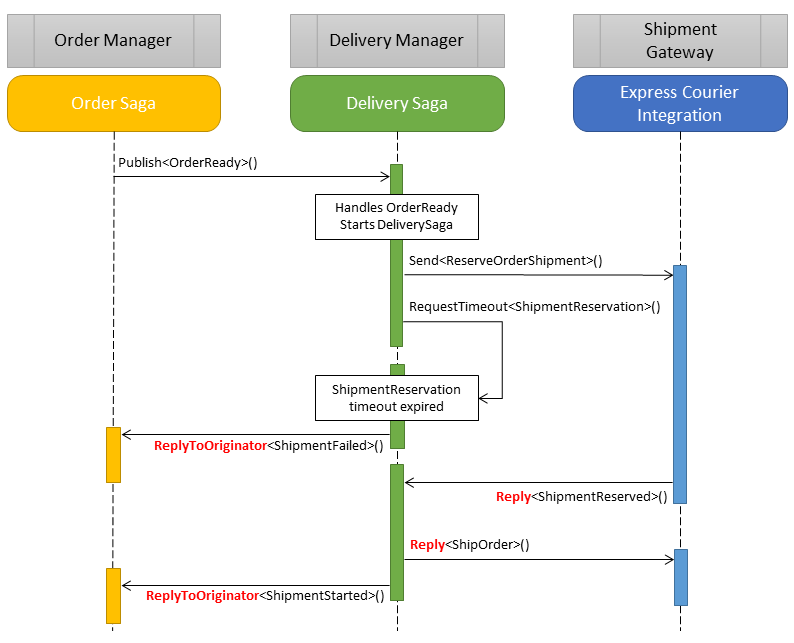 The following diagram details a scenario where two sagas and an integration endpoint utilize the request/response pattern to communicate. The replies are highlighted in red. The reason a call to Reply<ShipOrder>() sends a message to the Shipment Gateway is that it is invoked in the context of handling the ShipmentReserved message, and the return address of ShipmentReserved is Shipment Gateway. In the context of a Saga it is not always clear at first glance who the sender of a message is. In the above example, when handling the expired ShipmentReservation timeout the sender of the message is the Delivery Manager endpoint. In this case a Reply would be delivered to the Delivery Manager, and that is not necessarily the desired behavior. Calling ReplyToOriginator makes it clear to NServiceBus that the message to be delivered to the endpoint was the originator of the saga.